Zeppelin wasted no time recording their fourth album, doing so between touring dates in support of Led Zeppelin III. 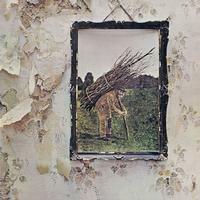 With tracks laid down at Sunset Sound in Los Angeles and the short-lived Island Studios in London, as well as various English countryside locations, Led Zeppelin IV was destined to be the band’s greatest triumph yet. Song for song, it is virtually a compilation of their greatest hits. Possibly the biggest surprise yielded by the album was the overwhelming reaction to "Stairway To Heaven," a radio perennial and one of the greatest rock songs of all time. Led Zeppelin IV was one of the most artistically influential and commercially successful albums in the history of music. Released in November 1971, the album — which is officially untitled — defined the sound of rock music for a generation with ubiquitous anthems such as "Stairway To Heaven," "Rock And Roll," "Black Dog," and "When The Levee Breaks." The album was inducted into the Grammy Hall of Fame in 1999, has been certified 23x platinum by the RIAA. Led Zeppelin was formed by Page, John Bonham, John Paul Jones and Robert Plant in 1968. It became among the most influential, innovative and successful groups in modern music. The band has sold more than 300 million albums worldwide with a celebrated catalog including such landmark songs as "Whole Lotta Love," "Kashmir," "Rock And Roll," "When The Levee Breaks" and "Stairway To Heaven." The band rose from the ashes of The Yardbirds, when Page brought in Plant, Bonham and Jones to tour as The New Yardbirds. In 1969, Led Zeppelin released its self-titled debut. It marked the beginning of a 12-year reign, during which the group was widely considered to be the biggest rock band in the world. Led Zeppelin continues to be honored for its pivotal role in music history. The band was inducted into the Rock & Roll Hall of Fame in 1995, received a Grammy Lifetime Achievement Award in 2005, and a year later was awarded with the Polar Music Prize in Stockholm. Founding members Jones, Page and Plant — along with Jason Bonham, the son of John Bonham — took the stage at London's O2 Arena in 2007 to headline a tribute concert for Ahmet Ertegun, a dear friend and Atlantic Records' founder. The band was honored for its lifetime contribution to American culture at the Kennedy Center Honors in 2012. In January of 2014, the band won their first ever Grammy award as Celebration Day, which captured their live performance at the Ertegun tribute concert, was named Best Rock Album.